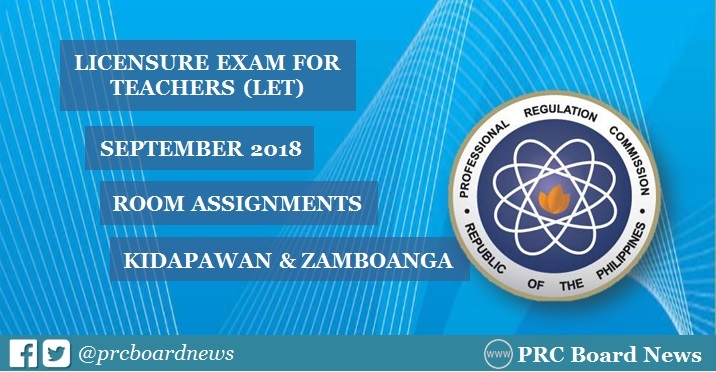 The Professional Regulation Commission (PRC) announced the list of room assignment and instructions for September 30, 2018 (Sunday) licensure exam for teachers (LET) or teachers board exam. Check out here the list of room assignment for Kidapawan and Zamboanga. Aside from , the September 2018 LET will be administered in Cagayan de Oro (CDO), Davao and General Santos, Baguio, Laoag and Rosales, Bacolod, Catarman (Northern Samar), Cebu, Iloilo, Legazpi, Lucena, Manila, Tacloban, Tuguegarao and Pagadian.